Die is a special tool used to change shape of sheet metal by cutting and non cutting actions. In the process of designing a die for a particular required specimen, you need to understand the basic sheet metal die components. There are many types of die which are used in the sheet metal operations. This is a part to which all the parts of die are attached so basically this is an elementary hub to connect all parts of die. It is made of steel. Die plate size depends on the required product after operation in the die. An assembly which consists of both die shoes is called die set. There are two Types of shoes in the die. Upper shoe and lower shoe. These two shoes are combined together with the help of Guide pin. The shoe thickness is directly proportional to the expected force to apply on the die during operation. These are the components to guide the tool towards the required direction. These parts ensures how the tool is going in the same position in every stroke of operation in the die. Basically the parts establishing an alignment between upper and lower part of a die. These components are of two types, friction pins and ball bearing pins. These parts are employed in the die to absorb the side thrust (if any) that generates in the die during operation. The Precision is required while machining these objects while making the die. Screws are the components to join the various working parts and components together i.e. Upper part and lower part of die are fastened through screw. Socket head is the most common screw for dies. Keys are rectangular blocks machine with high precision dimension for a hole. 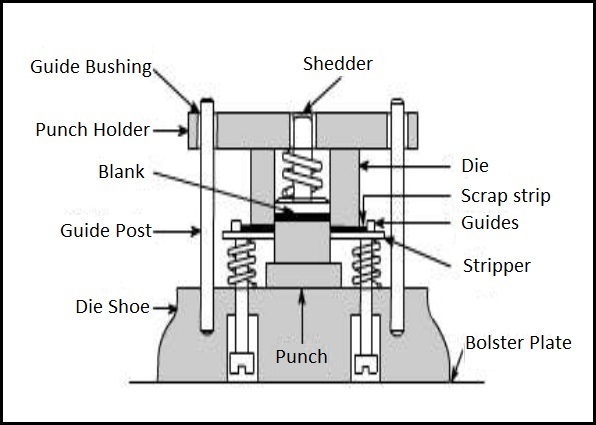 Keys are to be inserted in the Milled key way sections or pocket holes in the shoes of the die. Dowels are the types of pins used to fix the sections to a desired location precisely on the die shoes. Pads in the die are the plates employed for pressure loaded on the die during the operation it hold and control the metal. Pads used in the die needs to be fastned with the shoes. For that purpose, the spools are the components to be used. To supply the appropriate force from press to die to complete the operation, the various types of springs are used. The life of spring and force required are the factors that needs to be considered while selecting an appropriate spring. This is an important part that connect the upper die shoe to the lower die shoe. It is a hard metallic rod connected by using the bushings in upper and lower die parts. Guidepost plays the key role to guide the punching tool towards the specimen to perform the operation. Guide post bushing is a hollow part made of steel inside which the guide post travels in sliding motion. Punch is the main tool for cutting or forming operation to get the desired product. It is attached to the upper die set in a Press machine. This tool Contacts to the specimen and shape it as per the requirement. Both type of operations i.e. Cutting or forming are performed using this tool. Stripper plate used to hold the specimen on the die when tool cut off or strip the material. This is all about the sheet metal die components. For a tool design engineer these are the basic fundamentals about the die preparation in the tool room. The automobile industry uses these manufacturing processes in a very wide market. Both conventional or unconventional manufacturing methods needs die along with press machine or with CNC or VMC machines. Every parts of sheet metal die components are to be designed to get a working die to manufacture a desired product by cutting or forming operations.